At the beginning of each player's upkeep, that player discards a card at random. It is true that there are infinite "what ifs" in a game as open as Magic, but we know that there are certain cards we can expect to see in the most competitive formats. If we look at what is currently being run and why its effective, we can better prepare our decks to be more resilient against them. Your deck tries to combo out by ramping mana, drawing cards, and playing into a win-con. There are going to be certain styles of decks that are more prone to shutting you off, which is why I'm bringing up these strategies in particular. Since your combo window is turns 4-6, you need to be worried about two things in cEDH. The first is people comboing out faster than you. We see this in decks such as Gitrog, Godo Helm, or even Grenzo. When these decks are consistently busting their combo turn 2-3, you need to answer or lose. Relying on other players to put a stop to a win attempt will prove unreliable, which is why its so important that you slot removal. Your turn 4/5/6 answer does no good when the game is over by turn 2/3. If you have no way to turn off their win, you are asking them to goldfish to a victory on you. The second type of decks that will prove problematic for a turn 4-6 combo deck is stax, because their deck is designed to deprive you of resources and push your combo window so far back that you are unable to combo before they have won. They drop very fast and efficient heavy mana rocks, and then put down tax effects to make you unable to play. This specific style of deck can be hard for your build because they can lock you out of playing your draw spells, they can steal your draws, or simply prevent your draws altogether. Let me give an example to show you what I mean. Your opponent goes second, dropping Ancient Tomb into Grim Monolith into Mox Opal , using Monolith to play Voltaic Key to untap Monolith to play a Trinisphere . You take your third turn. You tap your two lands to Tanglewire, play a third land, and are still unable to play due to Trinisphere . Your fourth turn, you have to tap all 3 untapped lands to Tangle Wire , you play a land, and pass. You have basically been timewalked 3 turns in a row. Your opponent starts their fourth turn, dropping Tangle wire to 2 before tapping wire and sphere of resistance to Tangle wire. They are now free to drop more stax pieces ( Nether Void Winter Orb Static Orb Thorn of Amethyst Lodestone Golem Stasis ), play whatever commander/s they run, tutor up very cheap and cost effective winning combos, or establish a game-winning board presence that leads to their game winning combos. Your fifth turn starts, you tap two lands to Tangle Wire , and if you play a fifth land. You have 3 untapped, so you might be able to play a spell assuming they haven't dropped anymore stax pieces and aren't holding any counterspells. Note that you can only play a 1 or 2 cmc spell, Sphere of Resistance is out, so your commander is still a no-go, and Trinisphere ensures you are only getting 1 spell max here no matter what. Its more likely than not with your current build you won't be able to play any spells here at all because your average CMC is so high. You've basically been time walked 4 turns in a row. Stax is a very common archetype in the competitive scene, which is why its so important that you try to stax-proof your deck. It looks to me as if stax can cause serious problems for you. Another set of cards I would recommend taking a peek at is recursion. It can help against discard effects that would otherwise shut you off, or serve as a 2nd/3rd/4th copy of your draw spell. Wildest Dreams would work surprisingly well in your deck, the mana aspect is negligible and lets you reuse multiple big draw spells from your graveyard, as well as recover from wipes. Nostalgic Dreams is arguably worse with the additional cost, but can translate extra basics tutored by your 3 cmc ramp spells into more draws. Regrowth is also fantastic. I hope you don't mind the close inspection! I really enjoy your build, I'm just curious to know if you run into these cards and how you interact with them. Almost all the stax cards I linked are included in tournament proven cEDH lists with various commanders, so they're cards that are in the meta and will be played. Hi addk I am here again to talk about the discard section. Let's count the cards that makes opponents discard multiple cards in a row: Mindslicer , Sadistic Hypnotist , Stronghold Rats , Dark Deal , Torment of Hailfire , Bottomless Pit , Mind Slash , Necrogen Mists , Oppression and Painful Quandary . Hypnotic Specter and Liliana Vess discards one card per round, too slow. We have 10 cards that sinergizes with your commander, but observe that if you need to shut down the others u only have Mindslicer (if u have a sac outlet, there are 5 on the list), Sadistic Hypnotist (if you have another creature to begin the chain), Torment of Hailfire (perfect) and Mind Slash (if you have mana open and a creature to begin the chain). How about raise the perfect? Death Cloud with the right amount of mana can make all opponents lose theirs hands and you put more elves that you lost, not counting the fact that wipes the board and a geddon effect. Cabal Conditioning starts the count in 5, which is Nath CMC, cleaning the hands of your opponents and with potential to put 15 elves in play. Oppression , Bottomless Pit , Necrogen Mists , etc. all seem like great inclusions, and Words of Waste seems top notch especially with Geth's Grimoire ! SynergyBuild on Phyrexian Arena is BAD. Okay, clickbaity title, but yes, I firmly believe that Phryexian Arena, EDH verified staple, is a piece of cardboard worth nearly nothing to most decks that use it, and the sleek Night's Whisper or more versatile Sign in Blood is better in aggressively costed combo lists and storm decks, Read the Bones is better in midrange, and even in control, a larger draw spell that is an instant, think Ad Nauseam is just so much better. Even aggro decks woul rather a proactive possible threat that pressures life totals over time, like Dark Confidant or Mindblade Render , and the arena isn't powerful enough in nearly any of these decks to warrant the inclusion. Want a grindy engine, or have enchantment shenanagins? Greed , Necropotence , etc. are still better. Now onto why these are all so much better, and why poeople like the Arena, but it is still bad. 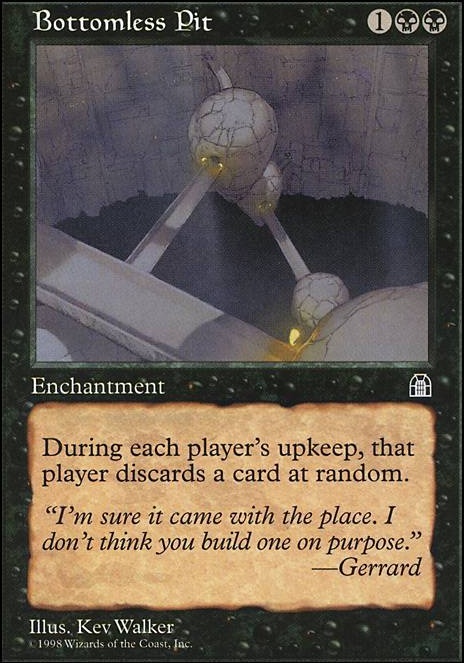 It is that Phyrexian Arena looks like a draw 2 per turn, however it is a possible only draw 1. You draw 2, but 1 you'd already get. It also, if removed on an opponent's turn, doesn't draw you anything, leading to card disadvantage. It takes 1 whole turn cycle just to be a cycler that loses a life and costs 3, and 2 turn cycles (8 turns) before it is as good as Night's Whisper , but costs more, and at turn cycle 3 (12 turns in) it gets the powerful effect of the 3 mana draw 3, lose 3 life, on a 3 turn suspend. Impressively bad for an effect like that. Read the Bones is more splashable, doesn't suspend, looks at possibly more cards, and loses 1 less life. 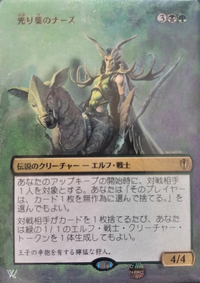 Dark Confidant / Mindblade Render costs less and have a creature attached and do about the same things, with more use in creature-abusing decks, perhaps being sacrificed later to a Attrition for more advantage need be, who knows. At turn cycle 4 (16 turns in), it gets the 4 mana draw 4 suspend 4, lose 4, which doesn't draw as much as a Moonlight Bargain , you need to be on turn cycle 5 (20 turns in) for that luxury, and with Ad Nauseam , you'd often draw 20 more cards in the single turn. See how that it bad? Especially in a color combination with many better, still generally bad card enginess that do basically the same thing. Dark Tutelage is more splashable, Greed draws more, Necropotence draws more, Mindblade Render is cheaper, more splashable, with more synergies, Dark Confident does basically the same as the Render, etc. etc. It is often compared to the black Sylvan Library , but that is cheaper and actually draws 2 cards, twice the work of the Arena. It isn't even in the same ball park of card advantage as the library. This was all off of the top of my head, yet, Phyrexian Arena is considered a staple, almost exclusively played in EDH, and is just not a good card despite that. Theater of Horros, a new red added variant to the Arena, at least when you have infinite mana wins the game, and has synergies with effects like discard. The only real time I have seen some use to the Arena is in stax decks that use a lot of the other options too. 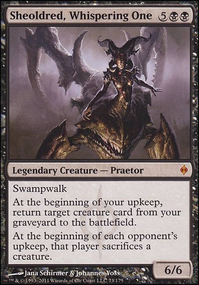 Mono-Black Stax often resorts to a lot of mass discard, think Oppression , Bottomless Pit , Necrogen Mists , etc. to empty everyone's hand turn after turn. Using Arena, Tutelage, Confidant, Render, Necro, and Greed all allow the stax deck to fish through it's deck and break parity on these stax lists, even if it takes 10 turns to make them worth it. Thoughts? Am I just not seeing it properly, or is it truely bad? The first thing I would recommend is finding a way to copy your namesake card the turn it's cast. Copies aren't cast, so both will resolve! It's pretty expensive, so having onboard ways are the best. Primal Amulet Flip is probably the best. If you utilize spell based ramp and tutors, you should be able to flip it. Swarm Intelligence , The Mirari Conjecture could also work. Since you're not planning on using your hand or lands into the late game, you might as well have onboard tricks that use those resources. To use your hand, you could play Rix Maadi, Dungeon Palace , Words of Waste , Null Brooch , Restore Balance , Jolrael, Empress of Beasts , Mageta the Lion , Stronghold Machinist , Stronghold Biologist , Greel, Mind Raker , Alexi, Zephyr Mage , Notorious Assassin , Knollspine Invocation , Pyromancy , and Magus of the Balance . To wreck everyone else's hand Mindslicer , Bottomless Pit , Creeping Dread , Necrogen Mists , and Oppression work. 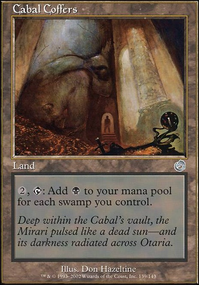 To destroy lands, you could use Desolation , Destructive Flow , and Mana Vortex . Ah, black discard...how I love it. Bottomless Pit might be a good fit. 1 - Go for a reanimator style list, with minor control elements. Abuse Apprentice Necromancer to the maximum, and have Shirei as a minor value pieces with some combo lines with Razaketh, the Foulblooded sacrificing creatures that trigger Shirei, so if the combo is disrupted, you have some board state to go off on your next turn. It could be a good mono-black combo list, as good as mono-black combo lists are in general, and can even have some very limited use for Shirei. 2 - Go for a stax list, abusing Shirei about as much as competitively viable as possible, trying to get good cards (think Bone Shredder ) that have innate value without Shirei and also a lot with, maybe 10-15 of these good useful creatures exist that work with Shirei and also aren't dead without like Heap Doll . Then run cards like Contamination , Smokestack , etc. 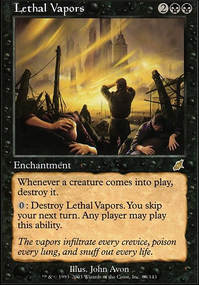 and maybe even some hate pieces like Lethal Vapors if you are feeling... 'Out there.' Finish the deck off with a various amount of non-shirei based stax pieces like Sphere of Resistance , Thorn of Amethyst , Damping Matrix , Oppression , Bottomless Pit , Leyline of the Void , Chalice of the Void etc. and a large amount of instant speed interaction to hopefully survive the early game like Fatal Push , Dismember , Warping Wail , etc. 3 - Go with a Midrange combo list. 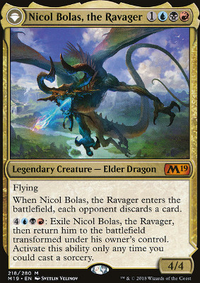 Try to find some value-oriented creatures and a mix of interaction, maybe a few minor stax pieces that don't affect you, and then a bunch of tutors to find some hyper-card-efficient combo that may or may not interact with Shirei. Try some Ad Nauseam storm maybe, maybe a Buried Alive combo, who knows. Make it survive the early game a get their turns 4-5 for the midgame win, with a decent controlling backbone to lie on when you can't combo out as early as you would want, due to a stax piece you need removed or whatever.